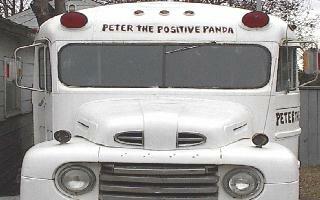 Peterthepositivepanda.com - Public appearances and picture gallery. -Guinness Book Of World Records For The Largest Gathering Of Mascots At Rundle Park Edmonton Alberta 1988.
with more than 100,000 people and looks forward to seeing you again soon. "Peter " Getting ready to do another show for the kids ! Always a perfect keepsake for family and friends. Peter has enjoyed every event that he has been to. Peter always loves his picture being taken. Stay tuned kids because there is a lot more pictures to come. See you again soon... Remember to stay "Positive".